Most adults are aware that drinking enough water throughout the day is beneficial for overall health, but most people still aren’t drinking enough. How many times have you heard someone say “If you’re thirsty it’s too late, you’re already dehydrated!”? To avoid dehydration and its unpleasant side effects make sure you are getting your 8 glasses in! Your body is composed of about 60% water. This is necessary to support digestion, circulation, the creation of saliva, the transportation of nutrients, and the maintenance of body temperature – among other bodily functions. As simple as it may be, drinking enough water throughout the day can make a big difference in making sure that everything in your body is in top shape and running the way it should be. If you don’t drink enough water, one of the first side effects you’ll notice is muscle fatigue. This happens because your body is experiencing an imbalance of fluids. If you exercise regularly, it is especially important to stay hydrated so that your body is able to do everything being asked of it during a workout. But even if you don’t frequent the gym, staying hydrated can help prevent your muscles from feeling sluggish. The kidneys are the body’s detox system. They help sift out waste and transport urine to the bladder. Your kidneys need enough water in order to be able to do this efficiently. If there is not enough fluid passing through your kidneys, the minerals within these fluids can crystallize into clumps and form kidney stones. Of course, you can still get a kidney stone even if you drink plenty of water, but staying hydrated certainly helps your system to run the way it’s supposed to and prevent unwanted blockages from forming. Nobody wants to deal with digestion issues. Fortunately, drinking water adds fluid to the colon, which helps ease digestion and make sure everything keeps moving through your body as it should. While no amount of water will magically make you lose weight, staying sufficiently hydrated can certainly help you shed unwanted pounds. 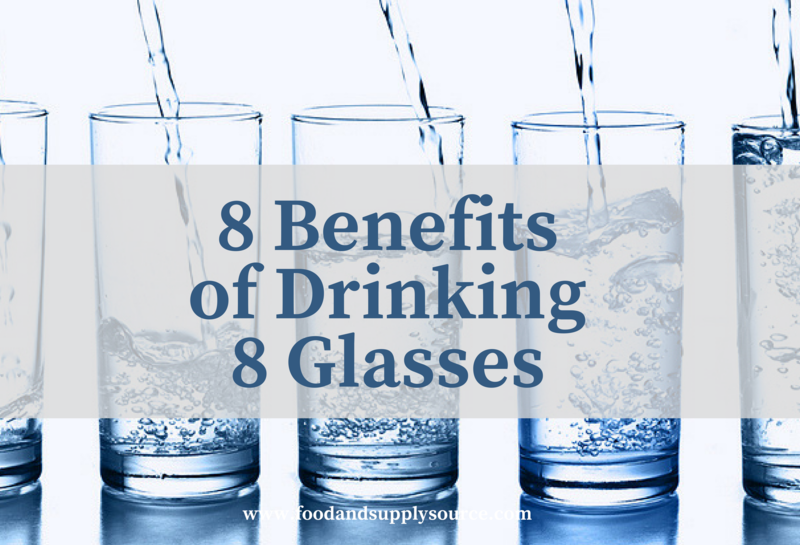 Who knew that was one of the benefits of drinking 8 glasses of water? Water increases your feeling of satiety. Drinking water 30 minutes before a meal helps you feel full and prevents overeating. Studies also show that drinking plenty of water boosts (if only temporarily) your metabolic rate, helping you burn more calories faster. So filling up on water can help you eat less, while simultaneously aiding your metabolism & digestion. Consider hydrating with beverages like green tea, which some studies show may boost metabolism and help to burn fat. If you find yourself frequently dealing with aching joints, consider increasing your daily water intake. When your body is well-hydrated, it keeps your cartilage soft and supple, helping your joints function properly. Some supplements taken for arthritis pain, such as glucosamine, work by helping the cartilage absorb more water from the body. By simply increasing your daily water intake, you can help soothe joint pain without having to take an artificial supplement. Drinking a lot of water can’t reverse the aging process; however, fueling your body with a steady supply of water can help to improve your skin’s overall clarity and appearance. When toxins build up in your body, it causes inflammation, often resulting in redness, dullness, dehydration of the skin, and/or acne. Fortunately, drinking enough water helps to flush these toxins out of your system and keep your skin balanced, clear, and well-hydrated from the inside out. In severe cases dehydration can even lead to confusion and loss of consciousness. So instead of reaching for coffee (which can result in further dehydration due to its diuretic effects) when you need brain boost, reach for water instead. Your body will thank you! When you’re busy working at the office all day, it can be hard to remember to drink more water – but this is vitally important for both your body’s and your mind’s health. What’s the best solution? Get your business equipped with filtered drinking water coolers! At Food and Supply Source, we work with the best wholesale vendors to help you find the products you need at a convenient price. Become a member of Food and Supply Source today and you can get your business equipped with the drinking water solutions at Quench. Prefer water bottles? We’ve got those too! Order through Staples Business Advantage and save 30% by signing up through us!